Measles virus (MV) infection induces both an efficient MV-specific immune response and a transient but profound immunosuppression characterised by a panlymphopenia that occasionally results in opportunistic infections responsible for a high rate of mortality in children. 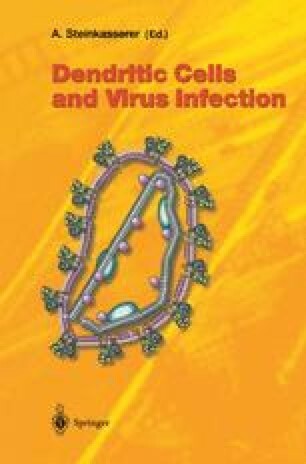 On the basis of in vitro studies, the putative roles of dendritic cells (DCs) in MV infection are discussed. (1) DCs could participate in anti-MV innate immunity because MV turns on TNF-related apoptosis-inducing ligand (TRAIL)-mediated DC cytotoxicity. (2) Cross-priming by non-infected DCs might be the route of MV adaptive immune response. (3) After CD40-ligand activation in secondary lymphoid organs, MV-infected DCs could initiate the formation of Warthin-Finkeldey multinucleated giant cells, replicating MV and responsible for in vivo spreading of MV. (4) We review how integrated viral attack of the host immune system also targets DCs: Progress in understanding the immunobiology of MV-infected DCs that could account for MV-induced immunosuppression observed in vivo is presented and their potential role in lymphopenia is underlined. In conclusion, future research directions are proposed.